Start building your playlist today. Thousands of visitors journey to Western North Carolina each year in search of backcountry adventures, and many find their heart’s desire in the Green River Game Lands, 14,000-plus acres of pristine wilderness in Polk and Henderson counties…. First Peak Visitor Center - Polk County, NC Travel & Tourism shared a post. Wow! Here's a rare closeup view of the 2 visible sections of Shunkawauken Falls - you can see them from a distance while driving on I-26W at Exit 67 in Columbus, NC. You can also get a closer look at the upper section via a scenic driving loop on a winding residential road. firstpeaknc.com/businesses/shunkawauken-falls/ Nice footage Blake.Is!! 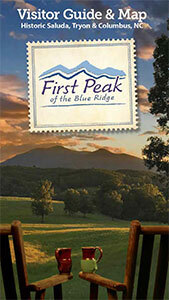 First Peak Visitor Center - Polk County, NC Travel & Tourism updated their cover photo. The Gorge: Vote for your favorite zipline or aerial adventure park in the U.S.! Hi everyone - please continue to vote daily so The Gorge Zipline will stay in the top ten!